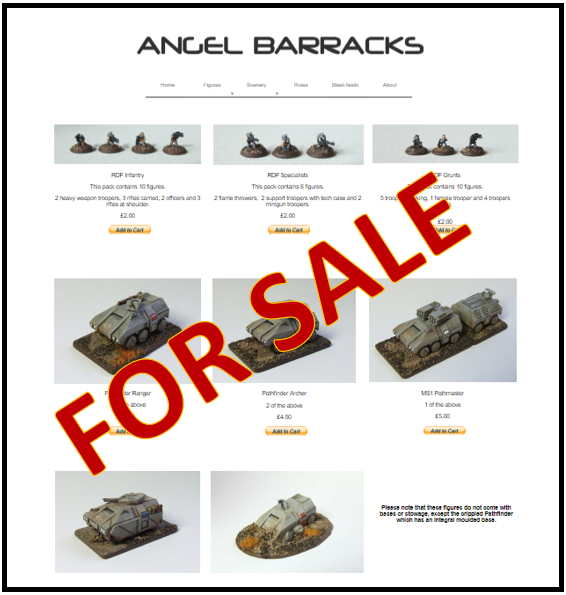 I am putting the Angel Barracks 6mm sci-fi product range up for sale. This includes all the masters I have, the greens and the 3d prints and the building masters. It also includes all the STL files I have. It also includes all the stock that I have. So to summarise, all the product and masters be they physical or digital. Note... Angel Barracks itself is not for sale, just the products and all the associated IP that goes with it. As some of you may know, in January of 2017 I launched Crom's Anvil and the plan was to make the AB 6mm sci-fi along side the CA 15mm fantasy. However here we are 13 months later and not a single new 6mm sci-fi product. I have taken an honest look at myself and concluded I would not be likely to make any more 6mm sci-fi in the next 13 months either. So rather than just let AB coast along as it is rather than grow, I have decided to let someone else pick up the torch and run with it. Angel Barracks - Size Matters! This entry was posted on Sunday, February 18th, 2018 at 20:35 and is filed under News. You can follow any responses to this entry through the RSS 2.0 feed. You can skip to the end and leave a response. Pinging is currently not allowed. Are you still making & selling items in the meantime? I’ll aim to pick up some more walls etc next time I make a 15mm order. Until sold, I will be selling and casting as per normal. Bummer, I understand why you are doing this but I can’t help but be a little saddened by it. Your sci fi stuff is one, if not the main reason I got into 6mm in the first place. If no-one buys it and carries it on I will keep it, so one way or another it will be around..
All sold, watch this space! That was quick, let’s hope it’s gone to a good home. Like Streozie, your 6mm world started me off in table top wargaming. I saw you start with the ECM then on what you have now. The new owner has now been mentioned on the AB website. Well, I’m glad you sold it so quickly. I really like CP models, so I guess this is a good sign. Now you can truly focus on Crom’s Anvil! I should have pretty much moved all the AB stuff to CP Models by the end of the month, so March should see me full time on CA and TWW. Glad you were able to sell everything Michael as it really is a superb range of models, scenery etc. Well glad to hear it was sold ! I’ve been think about getting some stuff ! DoH !!!! That’s thinking about getting some more ! He’ll’s teeth! I hadn’t realised this was happening. Hope it works out and good to see the products will continue.